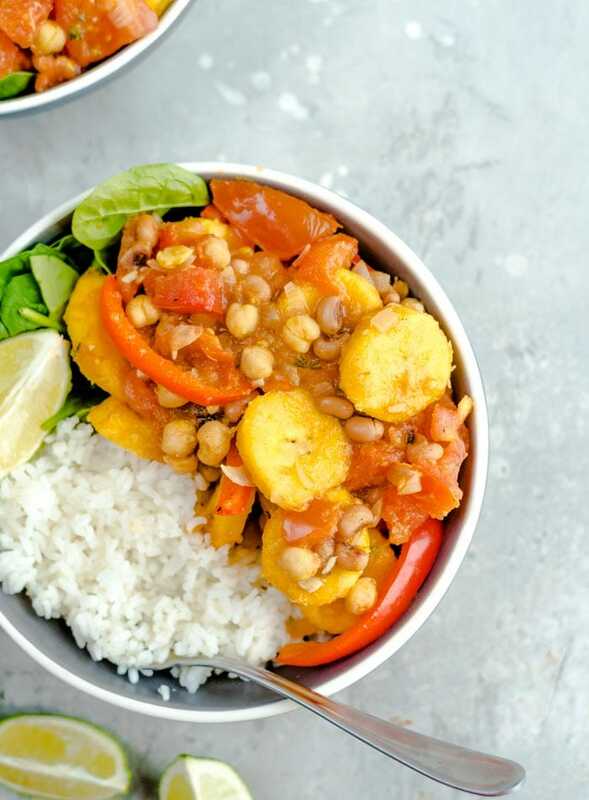 This vegan plantain curry is what easy dinner dreams are made of. It’s perfectly sweet and spicy, without the need for any fancy ingredients. 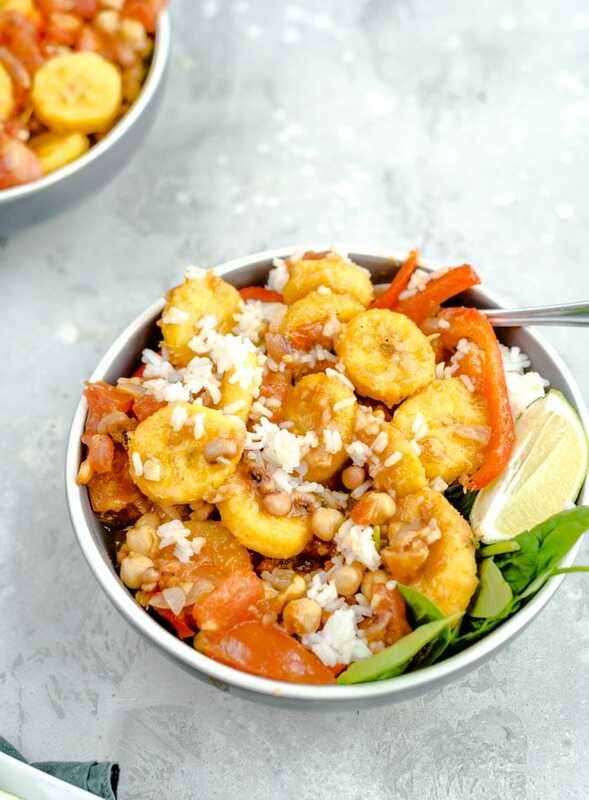 Sweet plantain adds a beautiful layer of flavour and texture that pairs wonderfully with beans, cinnamon, nutmeg, cumin and spicy peppers. Plantain is raw green banana that’s found in tropical climates on the shores of the Caribbean, South America or Asian and Africa. Although they look like bananas, they don’t peel as easily as a banana, they don’t taste like banana and you don’t eat them raw like bananas. Plantains are very starchy which means they need to be cooked before eating. As far as ripening, plantains are like banana in that they out firm and green, slowly turning yellow, then spotty and finally completely brown. For this recipe, look for plantains that are a little spotty or have some black markings, much like in the picture below. A ripe plantain peels fairly easily but if it’s on the greener side, cut each end off with a knife, then carefully slice it lengthwise before peeling the skin off around it. There are many different ways you can prepare plantain. They taste like bananas but have a starchier texture, much like a potato. My favourite way to prepare plantains is to caramelize them in a pan with some coconut oil and cinnamon, but that’s for another day. 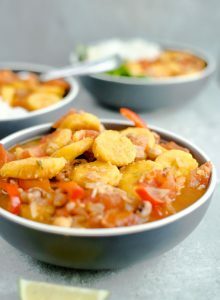 Today we’ll be simmering them with lovely Carribean-inspired spices to create the perfect plantain curry. You can also baked plantain in the oven or grill them. They’re fantastic in both sweet and savory recipes. If you haven’t cooked with plantains before, you’ll be hooked after making this easy curry. They are so good in this dish. 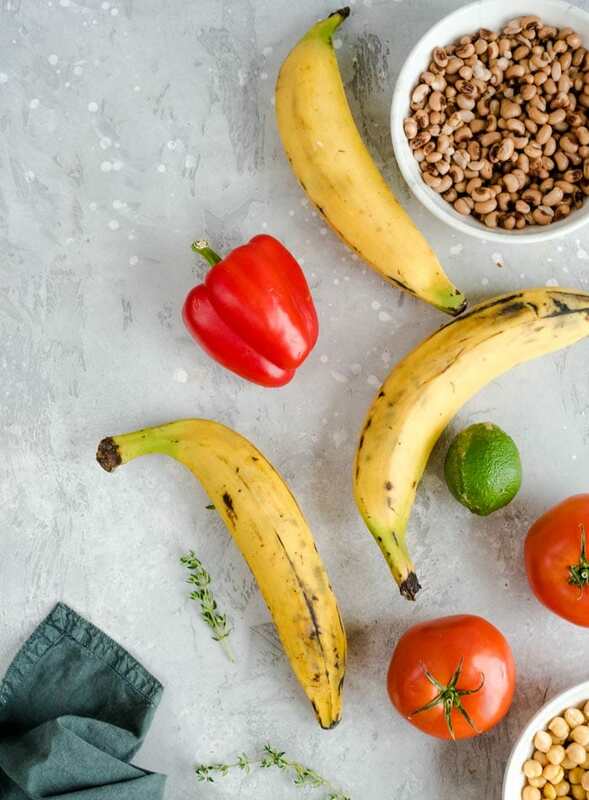 Are Plantains Good for You? You bet! Calorie-wise cooked plantains are very similar to potatoes but contain different vitamins and minerals. They’re a rich source of complex carbohydrates, A, C, B-6, magnesium and potassium and are easily digestible. 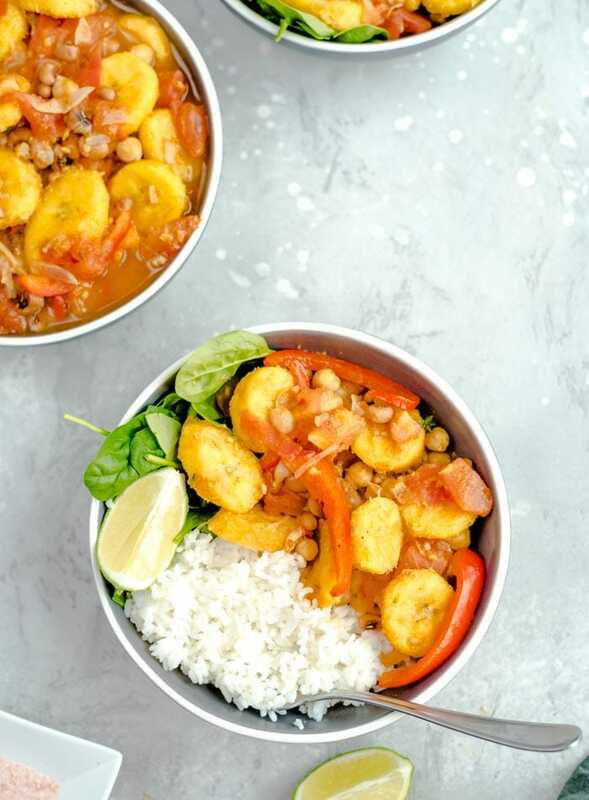 Made with sweet, tender plantains, tomatoes, cinnamon, nutmeg and spicy red chili, this spicy, savoury curry seriously delivers on flavour. It’s also surprisingly easy to make given how rich and flavourful it is. This is a great recipe for beginner cooks who what to try a simple but unique and impressive curry. The whole dish comes together in about 20 minutes including prep time. First, chop up the veggies and plantains and get the spices ready. If you’re making rice, start cooking that now. While you’re chopping, heat the coconut oil in a large pan over medium-high heat. When you’re ready, cook the shallots, garlic and spices for a couple minutes. Add the veggies and plantains, give it a good stir and cook for a few more minutes. Add the broth and beans, turn the heat down a bit a simmer another 15 minutes. Done! Time to enjoy! You can also make this in advance as it keeps well in the fridge up to 5 days. To make oil-free, cook the garlic, shallots and spices in a splash of broth instead of coconut oil. If you don’t want it spicy, leave out the chili pepper. In a pinch, you can use 1 28 oz can of diced tomatoes and their juices instead of fresh tomatoes. Mix and match any kind of beans up to 2 cups. Chickpeas, white beans, kidney beans, black eyed peas and even lentils all work well. You can enjoy this curry on it’s own or serve it over basmati rice, quinoa, brown rice or greens. Top it with extra lime and if desired, chopped fresh cilantro. 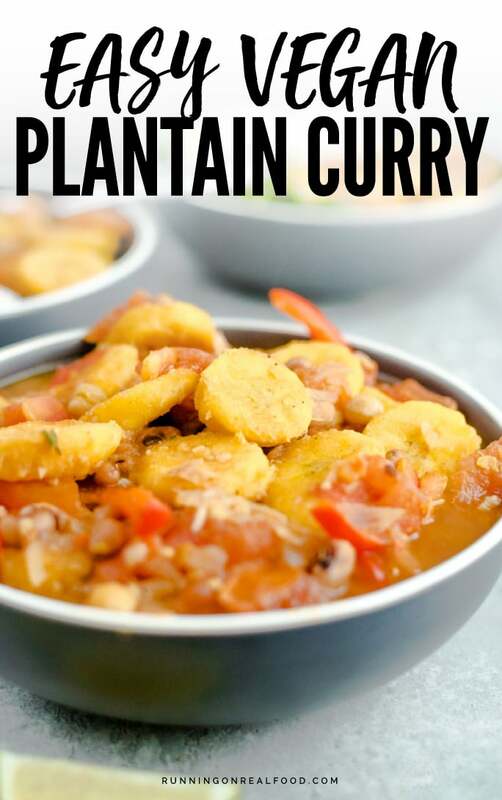 This deliciously flavourful plantain curry is perfect for weeknight dinners. The whole dish can be on the table in about 20 minutes. Serve it over your favourite rice, quinoa or a bed of greens. Add 1 tbsp of coconut oil into a large pot on medium heat (use a splash of water or both to make this recipe oil-free). Add the shallots, garlic, salt, pepper, cumin, nutmeg, cinnamon and stir slightly, then allow to simmer for 2 minutes. 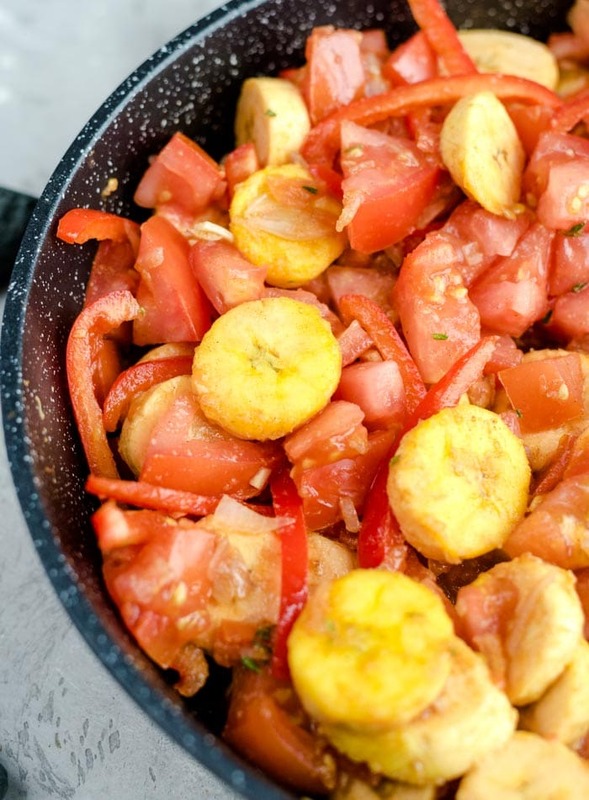 Now add in the thyme, peppers, chopped tomatoes and plantain.Stir into the other ingredients. Allow to cook for 5 minutes. Pour in the stock, black eyed peas, chickpeas, sliced chillies and the juice of a lime. Simmer oven medium heat for 10 – 15 minutes. Original recipe can be found on HelloFresh. While this recipe is tasty, the timing is off. 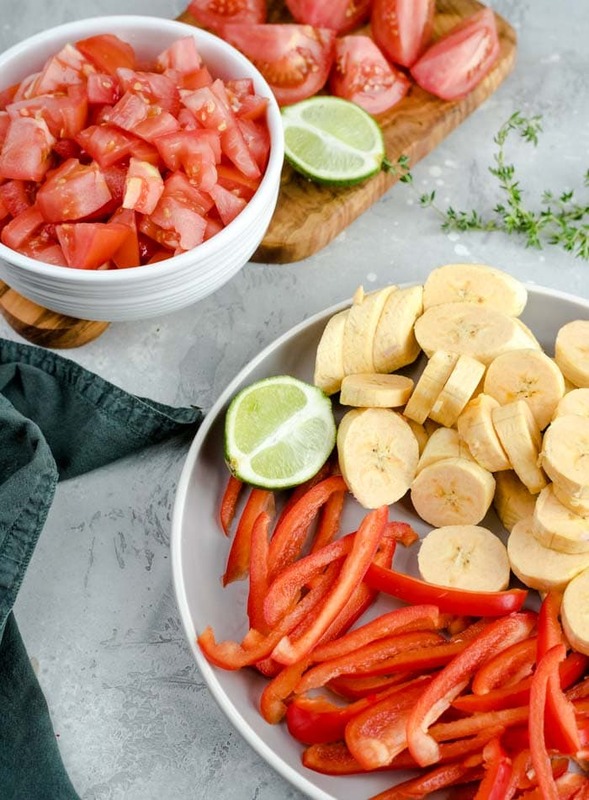 Unless the chili’s, plantains and vegetables are pre-chopped, it takes 45 min to clean and chop them. It took me 65 minutes to make this. Worth it but know what you’re getting in to. Thanks very much for adding your feedback. I guess I was speedy with my veggie chopping! !